Platelet-Rich Fibrin (PRF) is a second generation PRP (Platelet-Rich Plasma). It’s the same blood concentrate therapy concept but while PRP uses additives and chemicals in their vials, PRF is 100% natural and unmodified. The other difference between both techniques is that PRF will spin slowly while PRP requires higher spin times. Platelet Rich Fibrin (PRF) therapy works on the basis that the body’s own natural healing powers may slow and even reverse the aging process. It’s a revolutionary repair system that places growth factors in the exact location where we want the skin to repair and rejuvenate itself by working to increase your own collagen. The treatment involves harvesting platelets from the patient’s own blood in order to inject them into problem skin areas, starting with the extraction of a minimal amount of the patient’s blood. This is then placed in a centrifuge to spin down the blood, which separates the red blood cells from the platelet rich fibrin. Platelets contain a high content of “growth factors” – proteins that help to heal injured tissue or damaged skin. Upon re-injection the platelets release their growth factors which trigger surrounding cells to proliferate, in turn stimulating repair, increasing volume and rejuvenating the skin. Generally, you need two to three sessions after your first treatment. What can Platelet Rich Fibrin Therapy treat? Platelet Rich Fibrin Therapy can be used to treat numerous cosmetic problems, such as fine lines and wrinkles or crepey skin around the mouth and nose, crow’s feet and dark circles around the eyes, and mild drooping or sagging skin around the eyes or on the cheeks. PRF therapy can also be used to improve the appearance of dehydrated or mildly sagging skin on the backs of the hands, tops of the feet, elbows and knees. It can be used all over the body. In terms of medical treatment rather than cosmetic treatment, PRF therapy can be used to treat a multitude of problems, including osteoarthritis and ligament and muscle injuries. It has been used widely in medicine for a number of years. This is a non-surgical and totally natural way of stimulating hair growth. The Platelet Rich Fibrin (PRF) has proteins that regenerate the tissue and prime follicles for new hair growth. The treatment uses a topical analgesic to minimize the discomfort. 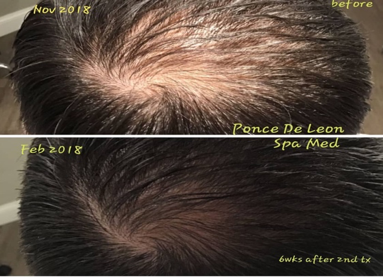 It’s ideal for male and female pattern hair loss, hypotrichosis (fine/reduced hairs) of the eyebrows or beard, and metabolic causes (due to iron deficiency and medication). There is no downtime, and the number of treatments may vary. 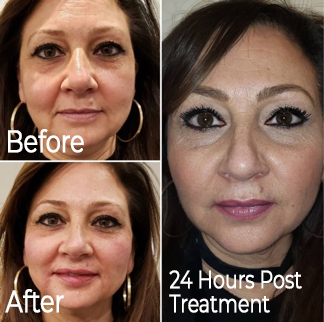 This non-surgical treatment utilizes Platelet Rich Fibrin (PRF) to provide a lifting and tightening effect on the skin. This treatment restores shape, smooths rough skin texture, and revitalizes dull or gray skin tones. It helps problem areas such as tear trough, smile lines, marionette lines, cheek volume and lip border. There is no downtime to regenerate the skin and achieve a youthful glow.